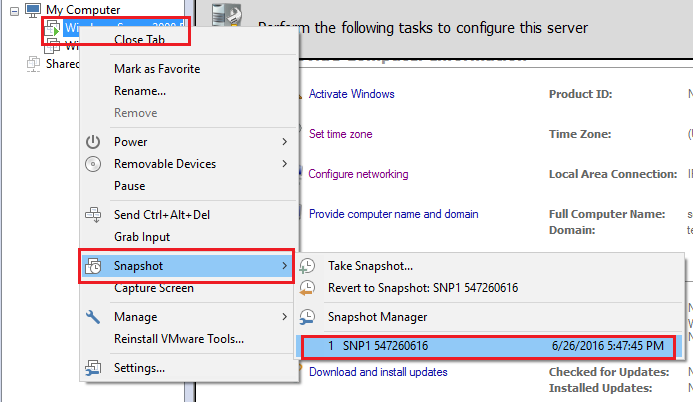 Techies Sphere: How to take VM’s Snapshot and restore VM using snapshot? 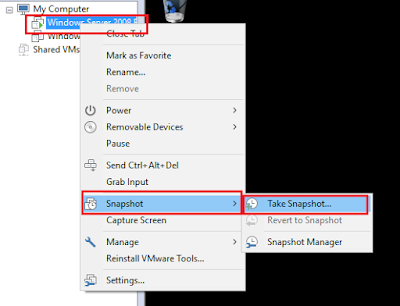 How to take VM’s Snapshot and restore VM using snapshot? 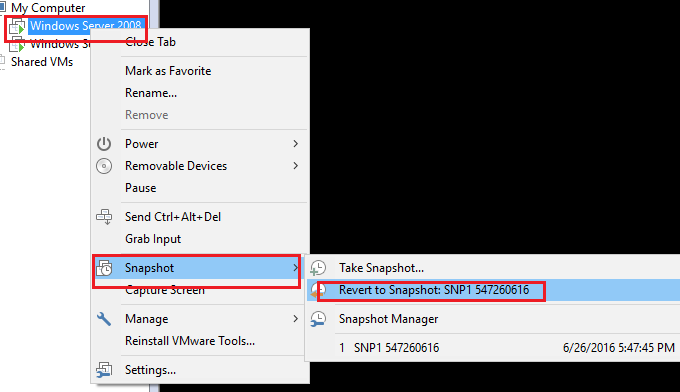 VMware Snapshot is a tool in VMware of taking backup of complete VM at a given time or Specific time. We do snapshot of VM’s before doing any changes to ensure if anything goes wrong with VM we can easily restore this VM at previous specific time. 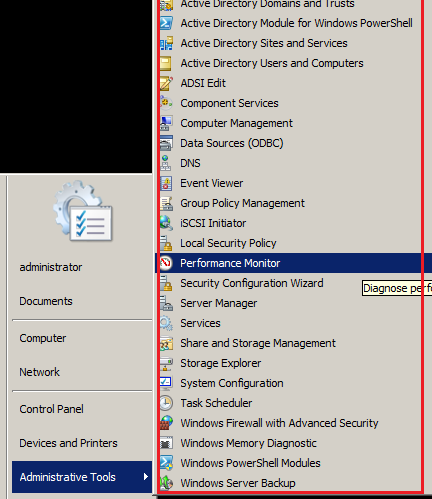 Now we will take a snapshot of Vm before doing a configuration change and later on we will restore that Snapshot. Case Scenario - I have installed file services in this server, and something went wrong with server, getting hung or not responding. So in this case we will go for snapshot restore (previously taken before installing file services). Login to VMware Vcenter or VMware Workstation to take a snapshot of VM. Select Server > R/C on Server > Click on Snapshot > Take Snapshot. 3. 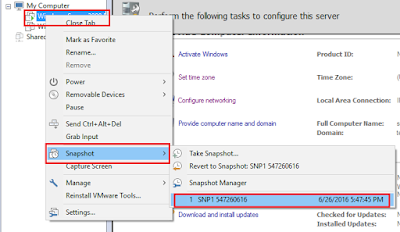 Give a name and Description to Snapshot to identify when need time of restore. You will find under snapshot manager the detail of snapshot. Some of the file services you cab see in the below screenshot which were installed after taking the snapshot of the Virtual machine. 1. Login to VMware Vcenter or VMware Workstation to take a snapshot of VM. 3. After click on revert to snapshot, VMware will display a Warning “that you will lost your current settings”. Click on yes. 4. VM will restart and Restore window will come to your screen. After Restore completion Login prompt will come. So Login and check your restore is done successful within minutes. 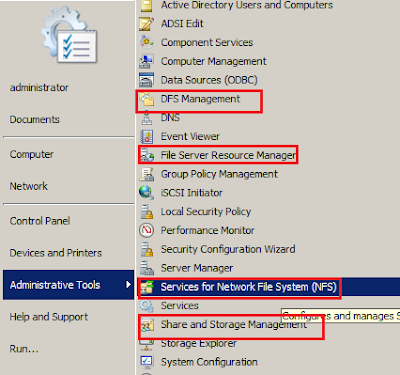 Note – That File services we have installed in VM, File services will not be found after restoration. 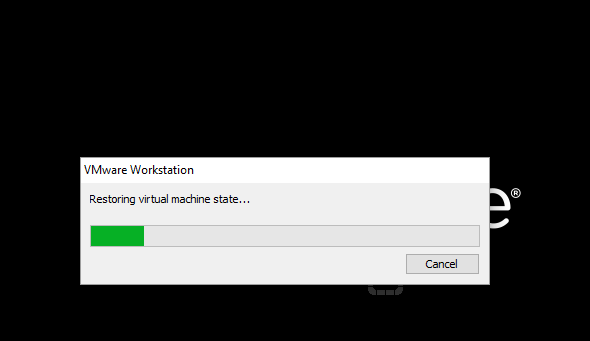 So This Ensure VM Snapshot is completely restoring to previous state.